A sorceress known as Monsteress was engaged in battle with the hero Samson and was leading an army of creatures. 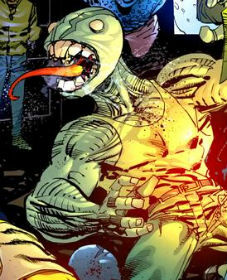 One such monster was Frogman who was defeated by the Golden Age superhero. He later returned as part of the Vicious Circle and started to hang out at the Freak Outpost bar. He is next seen mocking Mako for not being able to get rid of Dragon, but he is brutally and quickly knocked out by Mako. Frogman later helps Dart II in breaking Vicious Circle members out of prison.